President Trump on Thursday afternoon called an impromptu press conference to trot out unexpected guests: leaders from a federal employee union. Brandon Judd, NBPC president, said in his 21 years of experience he has seen first hand that walls are effective. 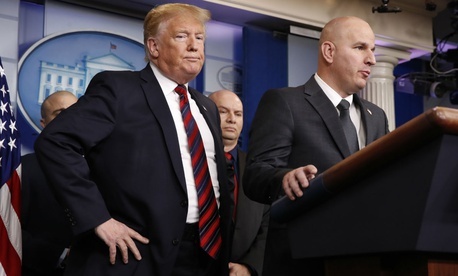 Art del Cueto, the union division's vice president, said on Thursday Border Patrol agents support Trump’s political strategy despite it putting them at risk of facing delayed paychecks. The officials said many federal employees support the shutdown because they support the wall. A recent Government Executive survey found that just 22 percent of federal workers overall support the shutdown. Only 30 percent support a wall, and 35 percent of those individuals do not support the shutdown as a means to secure funding for it. The National Border Patrol Council—which represents more than 16,000 employees—and the National Immigration and Customs Enforcement Council were the only federal employee unions to endorse Trump in the 2016 election. Both are subsidiaries of AFGE, which endorsed Hillary Clinton and has repeatedly spoken out against the shutdown.